Long the domain of commercial spaces, 70-volt audio systems are making their way into residential applications, with popular home-tech vendors delivering 70v speakers, amps and peripherals. 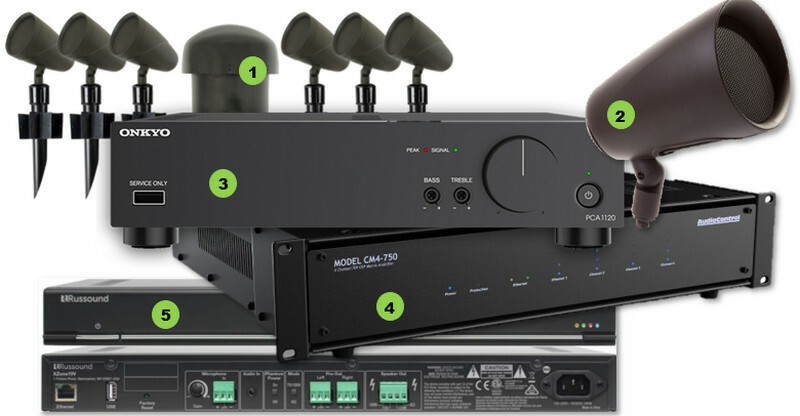 Long the go-to sound system for commercial venues, 70-volt audio systems are finding their way into residential applications, especially for outdoor music. Custom-centric home-tech vendors (like SpeakerCraft shown here) are rising to the occasion. 70-volt audio was a runner-up for CE Pro's Top 5 Home Technology Trends for 2019. Not that it's anything new, per se, but the category really heated up in 2018, and all signs point to a thriving future in the residential space -- after years of popularity in commercial venues. 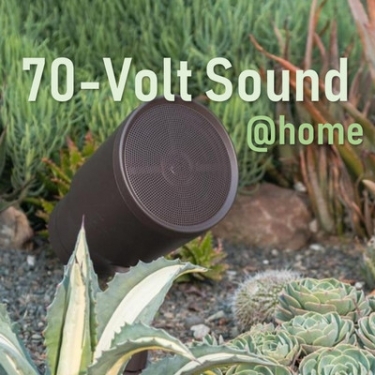 70v systems have gained popularity over the years for backyard tunes, but they're making their way inside the home lately. Most major audio brands in the custom home channel are introducing 70v options for indoors and out. I'M A FAN OF FITTING THE TOOL TO THE JOB. 70-volt audio systems, which include loudspeakers, amplifiers, mixers, and matrixes, can be the right tool for some jobs. You can use other tools to get the job done, of course, but the results may not be as durable or easy to operate. With that in mind, let’s review some of the components that go into a 70-volt system. Loudspeakers in 70-volt systems can be dreadful, brilliant, or lots of places in between. Every 70-volt loudspeaker essentially is a low-impedance speaker with a transformer on it; the transformer determines how much power, or how loud, the speaker will be in relation to its neighbors. Since most speakers will give you an efficiency rating, you can do some math to determine just what to set the transformers to, which is called the tap setting. In a common example, a large office space needs background music to cut down the cavernous hall feeling. It’s comparatively quiet, with no heavy equipment being used. A speaker rated at 90 dB at 1 watt measured from a meter away will be plenty loud in that environment, even tapped at one-half or one-fourth of a watt. For this type of installation, pleasant background levels can be easily achieved with an inexpensive 8-inch speaker with a dual cone driver. Home-tech integrators can find 70v systems from some of their favorite vendors, including 1) Sonance, 2) Origin Acoustics, 3) Onkyo, 4) AudioControl and 5) Russound. One reason why 70-volt systems are deployed is that they are easy to wire. Wiring can be home run from each speaker, or it can be daisy-chained from speaker to speaker, or it can be wired in a combination of manners, depending on the layout of the building. As an extra bonus, depending on the load, you can run lots of lighter gauge wire with no adverse impact on the system. There are enough variables to make rules of thumb dangerous, so check with your supplier if you have questions. An important thing to remember with 70-volt audio systems is sizing the amplifier properly. Essentially, you want to add up all the tap values on your speakers and have it be about 80 percent of the power output of the amplifier. For example, if you're doing an office building with 80 speakers, each tapped at 1 watt, you want to look at an amplifier that has a rating of at least 100 watts. If you’re working in an environment where you want to have a ton of energy in the space, you’ll want a more dynamic sound, with deeper bass, brighter highs, and more accuracy. Choosing better quality speakers, tapped at higher levels can help there, as can adding separate amplifiers and subwoofers. One solution that makes a great deal of sense in larger venues is to install a hybrid system. Essentially, use 70-volt speakers from mid and high frequencies, and use 8-ohm subwoofers to fill the bottom out. In many applications, this delivers a more robust sound, and actually allows the overall sound pressure to be lower. Since most 70-volt systems are monaural, you’ll find few amplifier choices in stereo. Controlling volume on a 70-volt system can be done in several different ways. Since each speaker has a transformer, you can adjust the sound for each unit. For example, you can set speaker A to be 3 dB louder than speaker B simply by adjusting the transformer tap setting so that A is at 2 watts and B is at 1 watt. You can adjust overall volume by using the volume control on the amplifier. You can also put attenuators on the speaker line so that when you adjust the volume up or down (understanding that you can only adjust to what the amplifier is set to deliver), all the speakers behind the attenuator adjust accordingly. Attenuators have size ratings, commonly 10, 35, and 100 watts. Make sure the speaker (or speakers) behind the control have a total tap value that is at or less than the capacity of the control installed. Amplifiers are the last part of the introductory phase. You can get strictly power amplifiers, which are fed off of a selector mechanism like a mixer, or you can get integrated power amplifiers, which have input selection and control for several devices. Since most 70-volt systems are monaural, you’ll find few amplifier choices in stereo. Determine what you need to do with the system and specify from there. If you are paging, for example, will you page from a phone system, or from a microphone? If you are providing background music in a commercial environment, what source are you using? Have you thought about music licensing, or, more importantly, has your customer thought about this? There are several types of inputs on commercial mixer amplifiers. Often, you’ll find two RCA style jacks; the amplifier sums those two channels to mono for you. You’ll find microphone jacks, which can be in a DIN, or XLR format. Due to size constraints, many manufacturers use removable phoenix style connectors for microphone or commercial level inputs. You may also find screw terminals for telephone paging connectivity. Count the total number of each type of input you’ll need and select the amplifier accordingly. Typically, commercial amplifiers without paging or source inputs use balanced signals to connect to an external mixer. Plan accordingly when ordering so you don’t waste a trip. Despite the wide range of 70v systems from resi-centric vendors, home-tech integrators are still using commercial stables from vendors like dbx, QSC and Crown. View Fred Harding's complete profile. There are more pros than cons with 70v for outdoor audio. With 70v, you can run lower gage wire over longer distances without issue. Additionally, you only have to make ONE (or two) runs for all of your speakers, which can make a huge difference in installation time and/or cost…it will also be less disruptive to your lawn and garden if you only have to trench in a single cable, instead of a pair of conductors to each individual speaker! Having more speakers means having greater coverage of your area outdoors, so the volume of each speaker can be lower, but still be enjoyable. If you host a party, the guests won’t have to shout over the music, but they will be able to enjoy the music anywhere in the yard! The NEIGHBORS on the other hand, won’t hear much at all, and are less likely to file a noise complaint! Yes, compared to low impedance speakers, they won’t sound quite as nice…but if the system is properly designed and powered, no one will notice. The quality of some of these 70v outdoor systems is quite nice, and if you heard one, you wouldn’t be concerned at all that they were 70v. 1. Transformers tend to do two things, with better ones not as bad as cheaper ones. They don’t like super deep bass (reason to add 8 ohm subs…) and they compress dynamics a bit. 2. Indeed, you can expect better fidelity from an 8 ohm system than a 70 volt system if all things are equal. Two questions for you and your readers that have more technical expertise than I do. Do the transformers limit the frequency bandwidth of the signal? Is maximum fidelity the reason that audiophile systems use low impedance speakers?